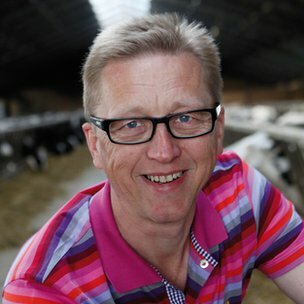 When Asger Christensen started farming there were 40,000 dairy farmers in Denmark. Now there are only 3000. This is a family farm, where they grow maize and wheat, as well as raising cattle. The Christensens bought it in 1982 from Mrs Christensen’s parents, and it has been in the family since 1760. They are survivors in an industry that has been squeezed hard. Dairy farming has come under intense pressure around the world in recent years. Retail giants have demanded the wholesale price of milk fall in many countries, making it more difficult for smaller producers to make a living. Falling sales in the United States in particular has also had an impact. For the past eight months, Mr Christensen has been involved in trialling GEA CowView, technology that lets him track the movement of every animal in his herd. Each cow wears a special collar, fitted with a wireless RTLS (real time locating system) tag. The tags are read several times a second by sensors fitted in a grid in the roof of their barn. The data is sent from the sensors to a hub, where the cow’s every movement is collated and analysed using complex behavioural algorithms.From this, the system can tell the farmer via real time alerts delivered to his smartphone whether the cow is ill, or is in heat and ready to be inseminated. “You can see in the system when a cow is beginning to be not so happy. The system can tell me two whole days before I can see with my own eyes if the cow is sick,” says Mr Christensen. All of which means that anything that can help maximise profits while maintaining a happy, productive herd of cows could mean the difference between healthy profits and the loss of a livelihood. Group dynamics: The data collected can indicate whether there is enough food available for the cows. The system also lets him find that cow quickly. “If I touch cow number 5022 on my iPhone, about two seconds later I can see where the cow is,” he says. When a tag is fitted it takes 6-10 days to build up a database of the animal’s behaviour, and the sensors have a range of up to 600 metres. Cows are creatures of habit, according to Mr Florczak. “If she can, she will choose to lie down for the same amount of time, eat the same amount and walk the same distance,” he says. “If a cow is coming into heat she will start to walk more, she will start to socialise more with the other cows, and she will be out of her cubicle,” “She needs the same amount of food, but she will be too active to stay there and eat, she will walk to the feeding table and then walk out to play with her female colleagues.” And equally a lack of activity can indicate illness or lameness. “Lameness is a huge cost to farmers. And if he identifies a sick cow he will have saved the cow, because the moment she has a physical sickness or a fever it’s already too late.” The system is being used in Denmark, Germany and the Netherlands – and is launching in the UK and US this month. Mr Florczak estimates it should pay for itself in one to two years.